Munich is known for its beer halls, and it’s well worth a visit to enjoy a stein or two. However, culture vultures won’t be disappointed by the Bavarian capital either, thanks to an eclectic art and architecture scene. Pay a visit to the ballet or opera, soak up the sights such as the imposing Frauenkirche church and walk around the many nearby museums. The 900-acre manicured English Garden is a popular playground for locals and tourists alike. It houses four beer gardens, a Japanese tea house and a man-made river which, impressively, is used for surfing. Originally established in 1839, at the request of King Ludwig I, The Bayerischer Hof is owned and has been run by the Volkhardt family since 1897. It’s considered to be one of the finest hotels in Munich, with five restaurants, six bars, 40 function rooms and the Blue Spa, which features a rooftop pool with a retractable roof. Past guests include Woody Allen, Brigitte Bardot, Robert De Niro and Sophia Loren. 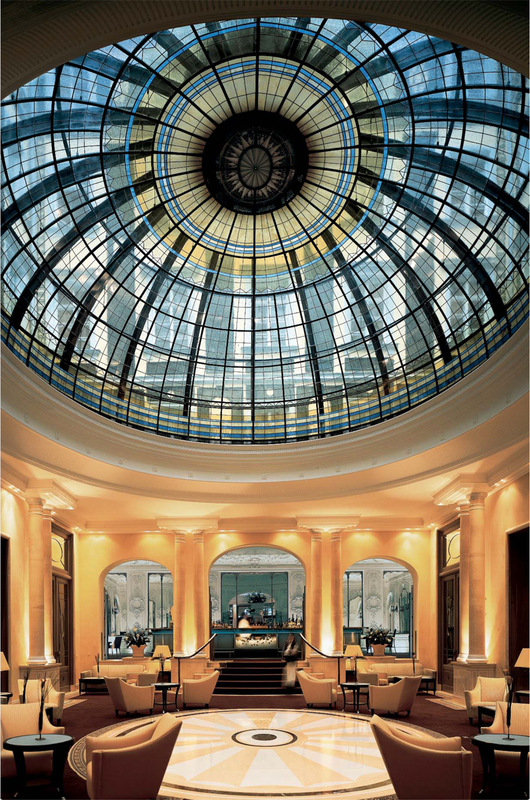 The Bayerischer Hof was almost completely destroyed during World War II – the only room to have survived unscathed was Falk’s Bar, located in the famed Spiegelsaal (mirror hall). The Bayerischer Hof is a foodie’s paradise, thanks to its array of restaurants, including the three-Michelin-star Atelier. A word of warning, though: the waiting list is long, so ensure you make a reservation well in advance of your stay. 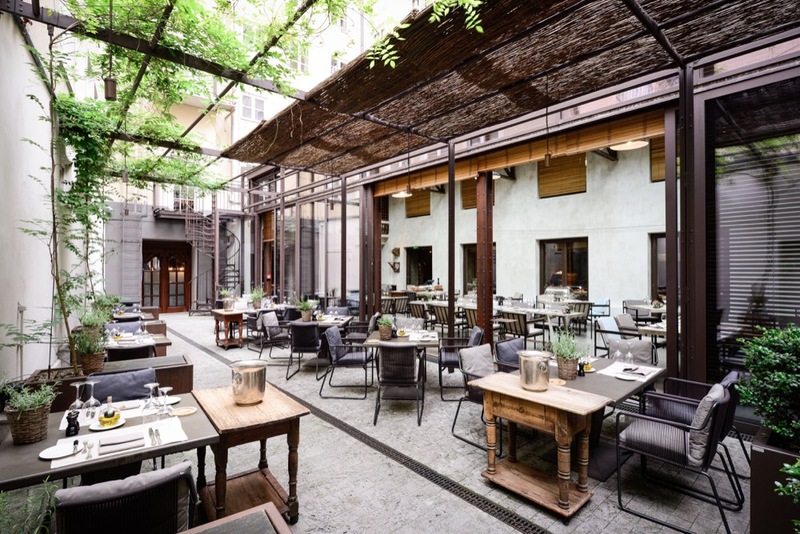 Elsewhere in the hotel, the Garden restaurant is exactly as you’d imagine, and diners can delight in modern takes on classic brasserie dishes under the stars in its glass-roofed conservatory-style space. Trader’s Vic is charmingly out of the ordinary – think tiki-style décor and fun drinks – and offers a taste of the South Pacific. Palais Keller, which has its own bakery, meanwhile, is a must-visit for those wishing to experience authentic Bavarian food – make sure you try the weisswurst and wiener schnitzel. Finally, one cannot fail to mention the roof terrace, where breakfast is served: soak up the vista of Munich with a glass of Champagne in hand. After all, you’re on holiday. Bavaria, the south-eastern state in which Munich can be found, is a rather unique corner of Germany, taking pride in a wealth of rich and quirky traditions. Bavaria can be thanked for the world-famous Oktoberfest beer festival and its Romantic Road route, which starts in Würzburg, winds south through pretty medieval towns, and ends in the foothills of the Alps’ southern border. Schloss Elmau – two hotels in one resort – is imposing on arrival: the original early 20th-century castle is über grand, yet blends seamlessly with the all-suite retreat added in 2015. The original edifice was built between 1914 and 1916 by Dr Johannes Peter Müller, a theologian and philosopher, as a hub for a new artistic and intellectual community. After it was severely damaged by fire, its owner Dietmar Müller-Elmau transformed the retreat in 2007. Set deep within the Bavarian Alps at the foot of a nature reserve, Schloss Elmau is only a 90-minute drive from Munich. Here, rushing streams fill the vast lakes, and the air is so clean that it’s no surprise that, as well as Schloss Elmau, some of the world’s leading wellbeing retreats call Bavaria home. (Schloss Elmau also hosted the G7 summit in 2015). There’s much to do on-site at Schloss Elmau. For the culturally inclined, it is home to a world-class concert hall, bookshop, four libraries, plus an itinerary of music, literature and debating events throughout the year. There’s also the largest hammam west of Istanbul and several infinity pools. Away from the hotel, busy yourself hiking, canoeing, horse-riding or paragliding. The 45-minute hike to mountain restaurant Elmauer Alm is well worth the trek, providing breath-taking panoramic views of the Alps and the Elmau valley from 1,200m above sea level. From a gourmet tasting menu at Schloss Elmau’s Michelin-star restaurant – Luce d’Oro – to fondue feasts at Kaminstube, there’s an eatery for every occasion. We especially recommend Thai restaurant, Fidelio; our favourite dish was the glass-noodle salad with minced chicken, prawns and spicy lime sauce, and the grilled beef tenderloin satay skewer with peanut sauce. Alternatively, family-friendly options include La Salle buffet in the castle and Tutto Mondo in the Retreat. The Summit offers fine dining, while private dining takes place in the Wintergarten.